At shipping time, fruiting peach trees are two year trees. #AP1400 Standard tree $39.95 . .
White fleshed peach. Semi- self fruitful. Good Southern variety. Ripens mid season. High quality mid-season white peach with a pink/red blush. Great taste and aroma. Stores and ships well. Heavy producer and very hardy. Ripens mid season. 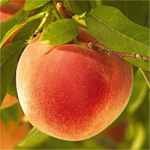 The standard peach for the commercial industry, has vigorous productive trees and medium sized fruit swhich colors to a brilliant red. Ripens early season. Hardy to -20F (-28.8C). Flowering peach with single pink blooms in spring. 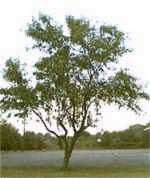 Rounded growth habit. Hardy to -20F (-28.8C); height: 25ft. Used extensively as rootstock for peach cultivars, this variety is a vigorous grower and extremely disease resistant. Hardy to -20F (-28.8C); height: 25ft.